With 80 people attending the meeting, none wanted to testify in support of the bill that would green light the Enbridge Line 3 tar sands crude oil pipeline. 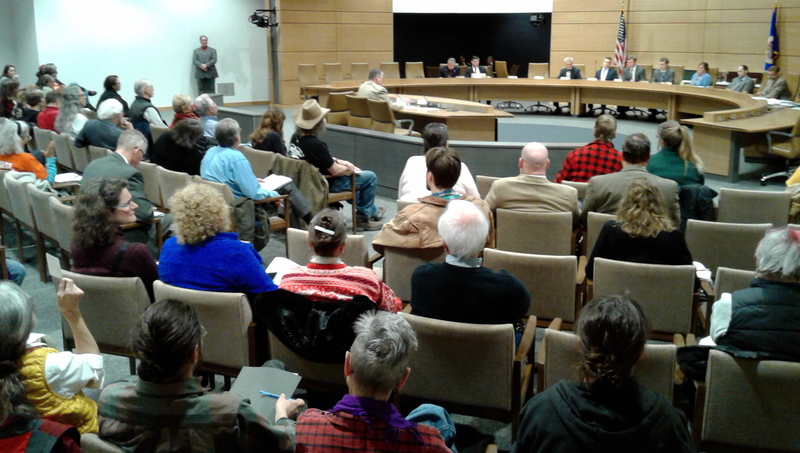 A key Minnesota Senate Committee voted down a bill that would have bypassed the Minnesota Public Utilities Commission (PUC) and approved the Enbridge Line 3 crude oil pipeline through northern Minnesota. The bill was an effort to subvert the formal review process at a time when a final decision is near at hand. An administrative law judge is expected to issue her Line 3 recommendations to the PUC no later than April 23. The PUC is expected to vote on Line 3’s route permit and certificate of need in late May or early June. In a surprise vote, the Senate Energy and Utility Finance and Policy Committee rejected S.F. 3510 Thursday on a 4-5 vote, with Sen. Michael Goggin (R-Red Wing) breaking with the Repubican majority and casting the deciding no vote. The bill would have ended the PUC process and approved the project with no conditions. Committee Chair David Osmek authored the bill and seemed ill prepared and uniformed about it. The proposal is not dead. A similar bill, HF 3759, is alive and awaiting a vote in the House of Representatives. As much as the deck seemed stacked to pass the bill, it didn’t happen. Plenty of people had signed up to speak against the bill, but the process didn’t allow it. Apparently the bill was a rush job and the committee ran out of time. Not listening to opposing voices was the very theme of the bill itself. Indigenous and environmental groups and ordinary people have engaged in opposing Line 3 over the past few years. They followed the rules and did their homework. They learned about all the technical stuff, about the Certificates of Need and Route Permits. They dug into the project’s Environmental Impact Statement (EIS). They attended numerous public hearings to voice their opposition. They submitted written and oral testimony. This bill would make all that work meaningless. Some of those in the audience had anticipated the bill would pass and expressed surprise when it was defeated. Minnesota landowners, businesses, communities, and residents may end up with a pipeline project they do not need. The Certificate of Need and Routing Permit processes at the PUC seek to avoid the building of unnecessary and costly facilities in our State. Only the PUC can take into account all of the facts, data, science, and technical expertise that has been developed and shared about this project …. Osmek spoke with more confidence than clarity. In defending his bill, he showed a lack of understanding of the PUC process. For instance, he said he was “tired of delays and roadblocks” in the project, and asserted that Line 3 had “cleared” the Environmental Impact Statement. True, the Public Utilities Commission had found the Environmental Impact Statement “adequate.” But that in no way means that the pipeline is environmentally safe or that it in anyway “cleared” anything. The EIS does not confer the Good Housekeeping Seal of Approval on the project. The EIS is a document that PUC Commissioners use to evaluate the project. It does not make a recommendation. The purpose of an EIS is described on page 3 of the Executive Summary. Therefore, the purpose of and need for this Environmental Impact Statement (EIS) is to help inform the Commission’s decisions by evaluating the potential human and environmental effects of permitting the proposed Project, considering reasonable alternatives, and exploring methods for reducing adverse effects. …The Commission will use the EIS to help it decide whether to issue a [Certificate of Need] and route permit. Osmek did not appear to understand his own bill. He was asked by a Committee member if his bill gave Enbridge the right to eminent domain and allowed for treaty violations. Osmek replied, fuzzily, that he didn’t think it did. Give Enbridge the right of eminent domain. Force Ojibwe bands to sue in court to defend their treaty rights. Preempt any state effort to require Enbridge to insure itself against the clean-up costs of future spills. This bill is a big giveaway to Enbridge. Osmek was willing to throw away years of public investment, engagement and research on this project without grasping the basics of the debate. It appears that making Enbridge happy was more important than honoring the process outlined in law and the commitment of this state’s residents to engage in the process.